Before you choose the gym bag that you want to purchase, think of all the potential uses that bag will have and how often you will be using it. A bag used once in a while does not need to be as sturdy and durable as the bag that is used every day. The three top choices we have reviewed for you here are all at the top of the list with consumers. Extensive research was conducted, comparing the top 20 gym bags against each other for performance, durability, storage capacity, comfort in carrying, additional storage and style. These three top rated gym bags are at the top of the list in all these categories. Having a good quality gym bag is a real benefit to transporting items to and from the fitness center, the pool, the tennis court, to travel with, and other transporting duties. They are not just for using at the gym anymore; many people use them as traveling bags when they don’t want or have a lot of clothing and other things to carry. 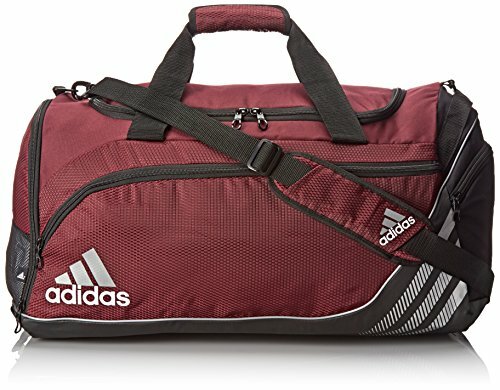 If you’re looking for a sturdy, reliable gym bag for trips to the gym or for other sports activities, the Adidas Team Speed Duffel will fit the bill. This medium bag is made of 100% polyester with 100% polyester lining as well. The zipper closure keeps your belongings safely inside. The 28” shoulder drop sits at a comfortable place while you are carrying it. It has one interior zip pocket and three exterior pockets that are perfect for your extra belongings as well. 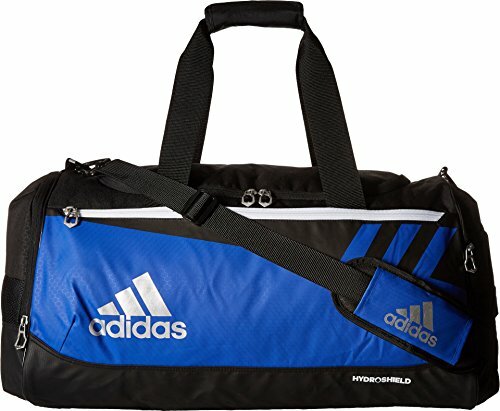 This Adidas Team Speed Duffel is medium sized and measures 24” wide and 12” high. It is available in a variety of colors including: light maroon with black trim, solid black, Collegiate Navy with black, Collegiate purple with black, Lead gray with black, Cobalt blue with black, Forest green with black, Team orange with black, University Red with black, Collegiate light blue with black and Black and Solar Red with silver. If you don’t need a lot of room to carry your belongings, the Adidas Team Issue Duffel in small is the perfect size. The large main compartment has a zippered pocket inside where you can keep valuables. On the end of the bag there is a freshPak ventilated compartment that is perfect for putting your shoes or sweaty clothing so it stays separate from your other belongings. The mesh drop pocket on the other side is great for additional storage if you need it. The front pocket with key fob is a perfect place to put things quickly. This gym bag has a ClimaProof water resistant bottom that will prevent the bag from being ruined if the field of gym floor is wet. It has an adjustable and removable shoulder strap, padded air mesh shoulder pad for comfortable carrying and wrapped hauling handles so you can carry your gear comfortably. There is an additional side haul handle that enables easy storage of the gym bag in your locker or the overhead compartment on a plane. This stylish and functional gym bag is the perfect way to carry your things to the gym or on short trips if you don’t want to carry a lot of luggage. The gym bag measures 12 x 22 x 12 and comes in a variety of colors including black, collegiate navy, intense pink, lead gray, collegiate purple, forest, university red, cobalt blue, flash oink with flash orange, gala pink, Midnight Indigo with Solar Yellow and Bold Blue, and Onix with Light Flash Red. 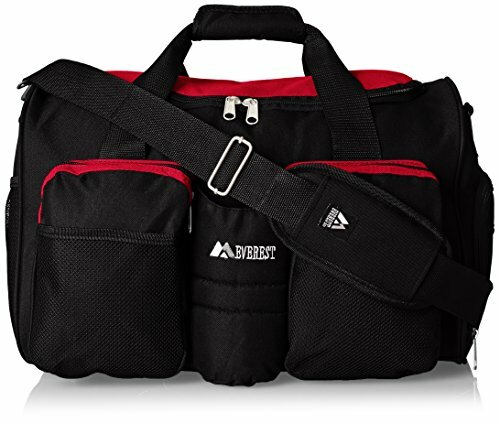 Whenever you need to carry gear in a bag that is not overly bulky, heavy or cumbersome, the Everest gym bag with wet pocket is a good choice. Made from 600d polyester, this sport gym bag with extra space is durable and functional as well as stylish too. It includes a side pocket for shoes or wet gear, two front zippered pouches, and a bottle holder as well. The adjustable shoulder strap is padded, making carting your gear from home to the gym comfortable and convenient as well. The gym bag measures 29.21” high and 45.72” wide, providing users with plenty of space for their gear and valuables. This attractive and spacious bag comes in a variety of colors including black with red trim, black with navy trim, solid black, black with bright royal blue, and black with grey. It is the perfect way to store your workout gear or take a short trip when you don’t want to carry a lot of luggage. Going to the gym usually involves carrying gear of some kind. What better way to do that than to get a functional and stylish gym bag? The three top choices we have reviewed for you here are all at the top of the list with consumers. Extensive research was conducted, comparing the top 20 gym bags against each other for performance, durability, storage capacity, comfort in carrying, additional storage and style. These three top choices are at the top of the list in all these categories. Read our buyer’s guide below to learn the best way to go about choosing the right gym bag for your needs. With the right information, you will be able to sort through the large selection of gym bags that are on the market and make an informed decision you will be confident about. There are many different materials used when it comes to making a sturdy, well-made gym bag. The material a gym bag is made of will determine the cost so it is important to know what your budget is before you start shopping. We have outlined the most common materials used in gym bag manufacturing. Leather – If you want something a little more stylish and longer lasting, leather is the way to go. Both men and women love the look and functionality of leather and it makes a great choice for gym bags as well. It is the most expensive option, but you will have this leather gym bag for years with proper care and will not have to worry about it tearing or wearing out the way other bags can do. If you are a swimmer who will be carrying wet gear around, you will probably want to consider another material that is waterproof or resistant. Some leather gym bags have water resistant or waterproof compartments for carrying wet clothing. The price range will depend on the quality of the leather used. Beware of the bags that say they are leather like. This is not the same thing as real leather and it will not have the same durability. Canvas – Canvas bags are less expensive and lighter weight than leather gym bags. Canvas is usually made of cotton or linen fiber that has been tightly woven for durability. A good quality canvas gym bag can last years. High quality canvas gym bags can weigh as much as 18 ounces which will be heavier to carry around. Many people don’t mind the added weight to ensure a good quality bag that will last. Some canvas gym bags with have leather accents which is a popular look for many gym goers. If you need a waterproof bag, look for oilcloth canvas which is canvas that has been treated with oil or another waterproof substance. Nylon – This is the least expensive of the gym bag options but is also one of the most popular. They don’t last as long as the leather and canvas bags do but they are usually very up to date on style and design upgrades, offering lots of pockets, places for wet clothing or shoes and even bottle holders. A nylon bag is a good choice for youth who are playing sports. Nylon bags usually come in a wide array of colors. There are different types of gym bags available on the market today. What you intend to use your bag for determines the type of gym bag that will meet your needs the best. If you are a runner that looks for the lightest bag you can find, you will want to look for the backpack style that is very easy for a runner to carry. We’ve outlined the different types of gym bags below. Duffel Bag – Duffel bags are also known as ditty bags or kit bags. These are the gym bags that have the most variety in color and style. They have a narrow shape that makes them very easy to store in a locker or overhead airline compartment and if it’s small enough, even under the airline seat. They used to be mostly cylindrical in shape but now can be rectangular or semi-circular. One of the most popular aspects of the duffel is the variety of sizes that they come in. You can choose a small one for a couple of things or a full sized super large one for traveling with. Duffels have shoulder straps as well as carry handles and typically have several pockets for other belongings as well. Backpack – Backpack gym bags have a range of weights from a lightweight runner’s backpack to a heavier one that have more structure and design as well as a shoulder strap and carry handles. Backpacks are easy to use and carry although a drawback is that they don’t have as much space as a traditional gym bag does. Some specially designed backpacks have features such as special compartments for water bottles and places to carry valuables safely. Backpack gym bags come in a variety of colors and styles. Shoulder Bag – If you don’t have a lot of equipment to carry but style is important to you, you may consider a shoulder bag. These are also called messenger bags and are easy to carry thanks to the sturdy shoulder straps they all have. These types of gym bags are designed to be worn across the body most often which is a comfortable way to carry them that doesn’t strain one shoulder or the other. Tote – Tote gym bags are smaller and more compact than the traditional duffel. They have wide openings and sturdy handles, making transport easy. Totes usually have detachable shoulder straps so you can just use the handles to carry it if you prefer. If you have a large amount of clothing and shoes, toiletries and other items, a tote gym bag may be a perfect choice for you. They can even be used as a great overnight bag for short trips. There are many different styles and designs that are available in the gym bag industry. You want to determine what exactly you want a gym bag for so you purchase the one that fits your specific needs. How much stuff do you need it to hold? Do you want a gym bag with lots of compartments and pockets? Do you need a pull handle and wheels or is a shoulder strap gym bag what you’re looking for? Do you need it to be waterproof? All of these questions are important to ask yourself before you purchase a bag. Size – The size of the gym bag will affect how much of your belongings you will be able to carry. If you regularly go to the gym after work and need to carry all of your gym clothes, shoes and toiletries, you will want to look at the larger styles that have more room. A gym bag can range from very small to really large and able to carry several days’ worth of clothing, shoes and toiletries on a trip. Wheels – A gym bag that has a pull handle that retracts and wheels is a convenient thing. This style is perfect if you use your gym bag to travel with. If you have a long way to walk, use public transportation or use airlines a lot, a wheeled gym bag can be a real shoulder and bag saver. Straps – Most gym bags have two handles on the top to carry it with but shoulder straps are popular features of these gym bags as well. Many styles offer both the carry handles and a shoulder strap that may or may not be removable. Straps can get tangled on things and be really annoying but they definitely change the way you carry your bag and could be easier to maneuver with a shoulder strap so your hands are free to hold other things. Compartments and Pockets – The most popular gym bags have plenty of pockets and compartments to store other valuables and belongings in. Some bags may have as many as 8 pockets in a single bag. These pockets can be used for cell phones, toiletries, water bottles, extra clothing, shoes, and much more. Some have waterproof compartments for wet or sweaty clothing. Before purchasing your bag, go through a mental checklist to determine just what you will be carrying. These compartments and pockets come in handy and can hold anything from a cell phone to a water bottle. Some have zippers and some are mesh so you can keep airflow getting to the wet or damp clothing. Purchasing a good gym bag can be a daunting task with the sheer number of styles and types that are available. The best gym bag for you is the one that meets all your needs. Knowing what you need first, is the most important step in selecting the right gym bag. Some people just grab any bag and not really put any thought into it at all. The downside to doing this is that you may end up with a bag that doesn’t fit all of your gear or that wears out too quickly. Take the time to research what you will need your gym bag for and look for bags that fit those needs. Introduction Encountering poison ivy can be a very painful experience – especially when you have no idea how to go about alleviating its effects….